A friend/colleague recently gifted me with a new Chicago Botanic Garden office mug—so appropriate since she knows I don’t go anywhere without a cup of tea. What she didn’t know was that I’d soon be digging into the Rare Book Collection at the Lenhardt Library because of it. My new office mug…tells quite a story. View all the items in the Orchid Show collection. 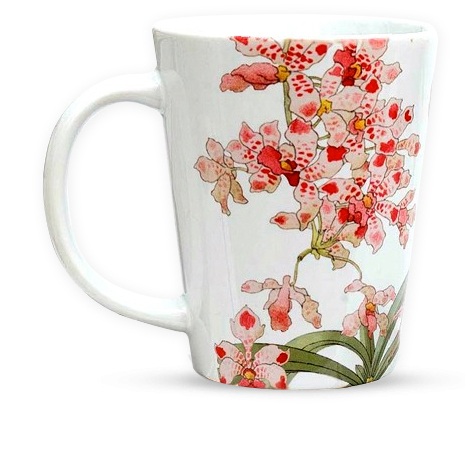 On the cup is a lovely graphic design of orchids—a topic that’s very top of mind here because of the Orchid Show, now in its final week at the Garden (click here for tickets). Fueled by a new-found love of the family Orchidaceae (a classic case of orchid fever), I took a closer look at the design. Was that a slipper orchid? Which one? What was the story behind it? Turns out the design stemmed from one of the Garden’s great treasures: our Rare Book Collection. At the Lenhardt Library, director Leora Siegel related the history and details. The drawings are by Henry Lambert, from a portfolio of 20 plates published as Les Orchidées et les Plantes de Serre; Études. The plates are chromotypogravures (a nineteenth-century French style of photolithography); Paris bookseller Armand Guérinet compiled and issued them in portfolio form, rather than as a book, between 1900 and 1910. The portfolio’s title translates as Orchids and Plants of the Greenhouse; Studies. Looking lively upon their return in 2012, the plates then became contenders for an interesting project: the development of the Garden’s own line of merchandise to complement the Orchid Show. Of ten finalists, Plate 4 from the portfolio won out, as seen here in the Illinois Digital Archives (page 8). Two orchids share the plate. The daintier, spotted, clustered flower is identified as Saccolabium giganteum (later re-classified Rhynchostylis gigantea), an orchid that’s native to Myanmar (formerly Burma). In 1893, its habitat was described as “where the hot winds blow and where the thermometer in the dry season is about 45 degrees Celsius (112 degrees Fahrenheit) in the shade….” (Veitch, A Manual of Orchidaceous Plants…). The American Orchid Society has a nice write-up about this species and its varieties here. 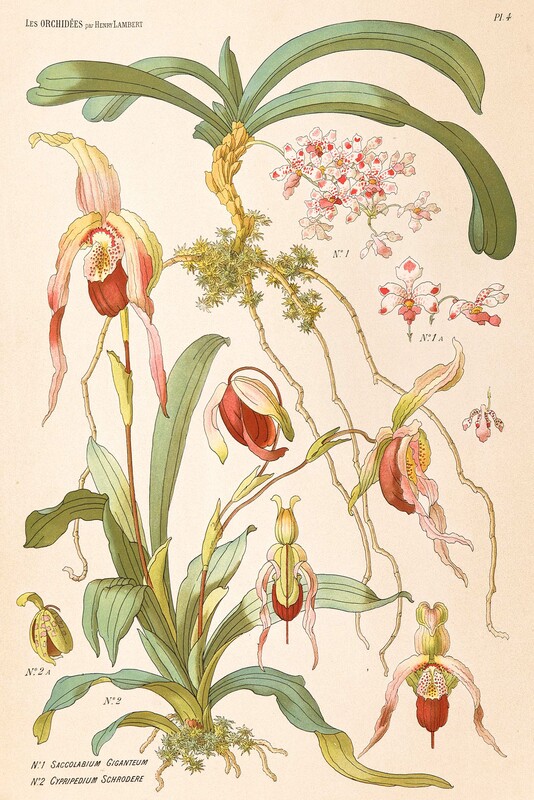 The slipper orchid Cypripedium schrodere is listed in the 1906 Hortus Veitchii as Cypripedium (Selenipedium) x Schröderae, with the note, “It is one of the finest of the Selenipedia hybrids, and was named as a compliment to the late Baroness Schröder of the Dell, Egham.” Nomenclature for lady slipper orchids gets complicated; the American Orchid Society goes deep into the history here. A Mother’s Day (May 11) gift idea: an exclusive Orchid Show item, plus the promise of a trip to the Orchid Show in 2015! Next, a graphic design specialist worked with the orchid illustrations, using a bit of creative license to fit the prints to the shape of the products: the cut of a coaster, the drape of a tote, the curve of a coffee cup. From that work came the Garden’s exclusive collection—it’s only available online and at the Garden Shop!—of items that are practical, meant for everyday use, yet connected to a deeper story. Good design transcends time. It’s quiet, yet thought-provoking. Now that I know the story behind the orchid design, I look at my friend’s gift differently. This is beautiful! and I wish I lived closer to Chicago…would love to visit the orchid show! Thanks for the story- lovely.